I truly believe that adventure is everywhere and comes in all forms. 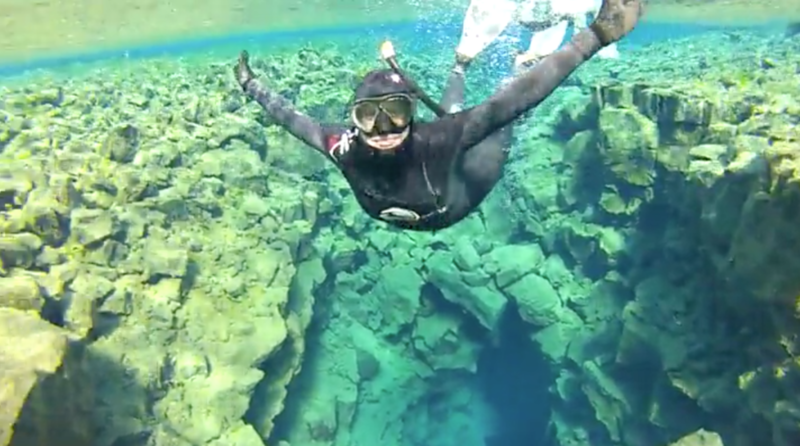 I love to find unique things to do when I travel so snorkeling in Iceland seemed just about crazy enough for me. And, double whammy, it was something I was terrified to do! Not because there's anything that can kill you down there, well, no wildlife that is, but because it was unknown and of course super cold. 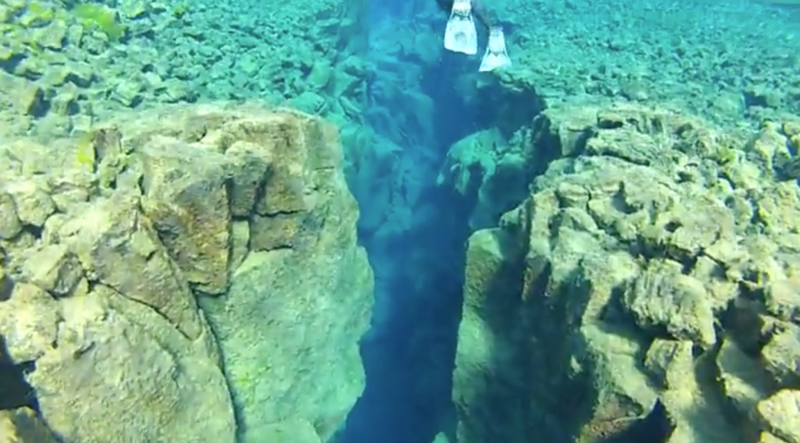 The Silfra Fissure is located in Þingvellir National Park and is the only place in the world where you can snorkel in between two tectonic plates. 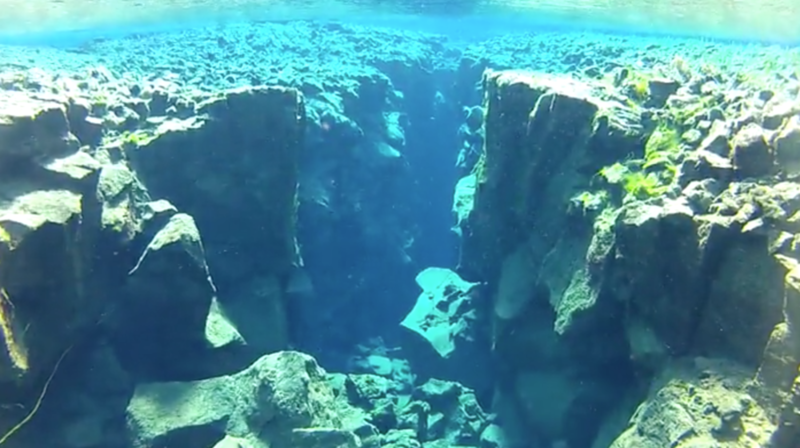 In some places you can even touch both the North American and Eurasian plates at the same time. You can see up to 260ft. down making it some of the clearest water in the world and one of the world's top diving locations. 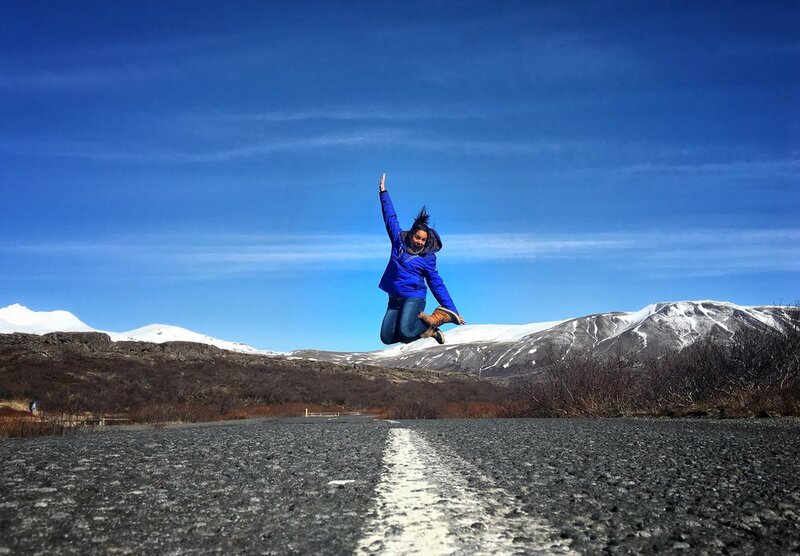 I first heard about it from two friends who had just come back from Iceland and their photos looked incredible. But let's be clear, these friends are SUPER buff, super adventurous, adrenaline chasing people. One is a personal trainer, the other is a dancer and they're both skydive instructors; so when they told me "If we can do it you'll be fine" I wasn't feeling so confident! They also told me that while every other company snorkels in dry suits (allowing them to layer up for warmth and float on the surface), Adventure Vikings gives people the option of a wet suit (you feel every degree of cold water but can dive down below). We headed to meet up with our guides and it was a brisk 40 degree day surrounded by snow-capped mountains, and high winds. Our shuttle picked us up to take us over to the fissure and the guide explained that it would be extremely cold and we were NOT to stop moving. When we arrived, there was one other person who had signed up for a wet-suit who changed her mind so out of hundreds of people snorkeling for the day it was just Kristin and I braving the cold. We were told it was the choice between driving a school bus and driving a Ferrari, of course we chose the Ferrari!!! After some brief instruction (and slight panic) it was time. The first couple of steps into the water were shocking. The water stays between 36º-39º year round so basically it's like jumping into an ice bath. But the second I took my first glimpse below, the temperature was far from my mind. The crystal blue-green waters took my breath away even more than the cold. The water spends years going through underground lava filtration making it extremely clean, clear, and potable. It was the most amazing water I've ever drank! The tour is not for the faint of heart though. We did have one member of our group (who was in a dry suit) panic about 5 minutes in and had to be taken out early. There have been at least 10 accidents in the fissure and 5 fatalities; a fact I'm glad I didn't know before we went. So please be cautious if you have any heart conditions or don't think this is something for you. The guides are absolutely amazing and it's incredibly safe for the most part but it is something to be aware of. 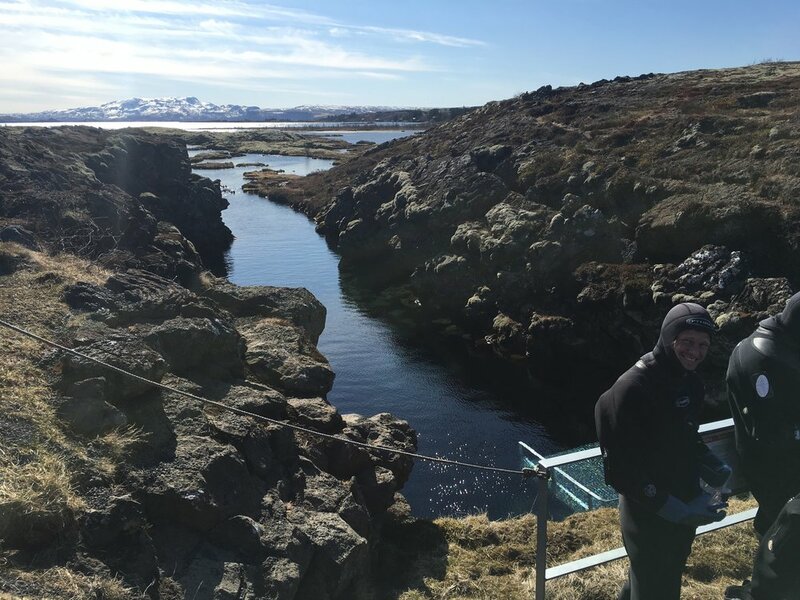 While the entire tour is around 2-3 hours with instruction and shuttling, the time in the water is around 25-45 minutes from the fissure entrance to the lagoon. As everyone in the dry suits exited the water, Kristin and I were having too much fun to leave just yet. We were told being in wet suits the most important thing was to keep moving no matter what. 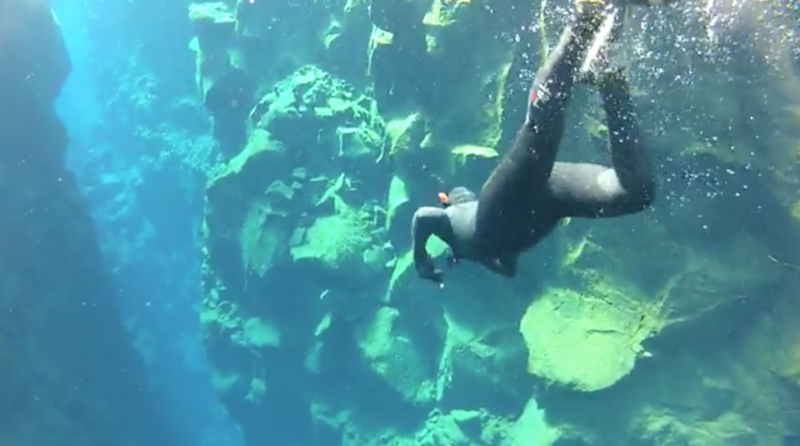 As we were entering the final section I realized that I was so busy filming underwater that I hadn't been kicking my legs and suddenly my feet were completely numb. I realized my time was up. Once I exited the water and was walking back to the shuttle area I realized how difficult it was to walk with numb feet. The worst part was trying to change in the van when my fingers were completely useless and frozen. I actually had to ask another girl to help me get dressed. The adrenaline had only gotten me so far and I was finally seeing the effects of the cold temperatures. This was by far the most incredible adventure I've ever been on. I would do this a hundred more times if I could. 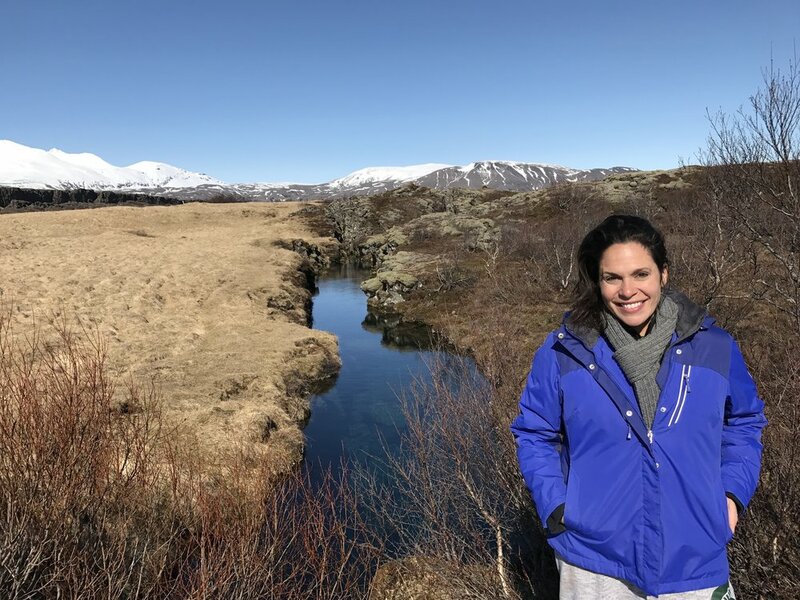 Travel and adventure helps us see the world from new perspectives and looking down into the depths of a glacier fissure between two continents is a perspective that will be as clear as the water was in my mind forever.